Count the TM matches in the certain tasks and projects. 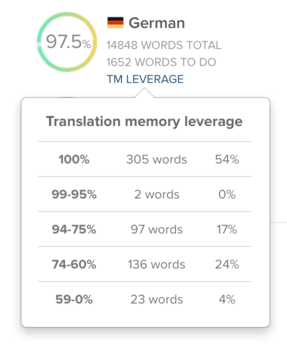 Translation Memory leverage is a useful feature for customers who outsource translations from the third party agencies, as it allows you to pay less depending on the initial TM leverage. There are several ranges you get (see screenshot below) which you can use when calculating the cost per word. First, you can access it at the project statistics page, that shows the actual TM leverage in the project. It may take a couple of seconds to recalculate. Second, it is available when you are creating a task. The system will calculate the initial TM leverage at the moment of creating a task and save it for a later use in the task details. Tick Save intial TM leverage checkbox. Once required, check the initial TM leverage in the ongoing/past tasks as well.